Chairman Gallegly, Ranking Member Lofgren, and other subcommittee members, thank you for the opportunity to be here today to discuss the Scott Gardner Act, a bill that will facilitate the removal of illegal aliens who are arrested for drunk driving offenses. This bill addresses a very serious gap in immigration law enforcement that enables a particularly dangerous set of individuals to remain in our communities in defiance of our laws. Although ICE has the authority to detain and remove illegal aliens in general, and has programs in place that prioritize the removal of illegal aliens who are a threat to public safety, in practice many illegal alien drunk drivers are falling between the cracks, sometimes with tragic consequences. This problem has worsened in the last several years, as the Obama administration has moved to scale back immigration law enforcement to only the most egregious offenders, made it harder for local law enforcement agencies to help them identify offenders, and failed to act against local governments that deliberately obstruct their ability to enforce the laws that Congress has passed. 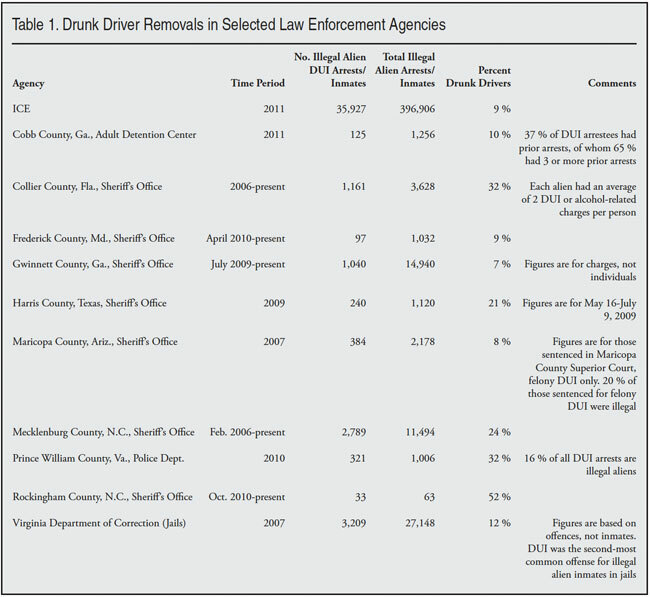 Statistics on Illegal Alien Drunk Driving Arrests and Removals. According to the National Highway and Traffic Safety Administration, drunk driving is the most frequently committed violent crime in America, killing 10,839 people last year, and costing the public billions of dollars annually.1 Illegal aliens who drive drunk usually come into our criminal justice system with three strikes: unlawful presence, drunk driving, and driving without a license. There simply is no rational argument for allowing drunk drivers who are also illegal aliens to remain here in defiance of our laws. According to ICE director John Morton, in FY2011 the agency removed 35,927 individuals who had been convicted of driving under the influence (DUI). This is 9 percent of the total number of removals (396,906) for that year. That works out to almost 100 alien drunk drivers removed every day of the year. So why do we need this bill? Because based on the statistics I have reviewed, conversations I have had with law enforcement officers, and the all-too-frequent and heartbreaking stories in the news media and from victim's families who contact me, there are still too many illegal alien drunk drivers who are escaping justice and evading immigration law enforcement. This puts the public needlessly at risk. Experts agree that drunk drivers are particularly prone to re-offend, especially if they have not faced swift and stern penalties for their first offense. Consider the case of 10-year old Anthony Moore. In May of last year, Anthony was walking to his bus stop in Minneola, Fla., when he was mowed down and killed by unlicensed illegal alien Mario Alberto Saucedo. Saucedo had at least two prior charges for DUI and a probation violation, but prosecutors had declined to pursue convictions, or charge Saucedo with the criminal offense of unlicensed driving in the prior offenses, enabling him to escape the ICE attention that could have saved Anthony's life if Saucedo had been removed promptly when first brought to the attention of police and prosecuting authorities. While there is limited information available, figures from ICE's local law enforcement partners suggest that many illegal alien drunk drivers are being identified, but not necessarily removed by ICE. The table below presents statistics from some of the few local law enforcement agencies that are able to track the crimes committed by the illegal aliens that they refer to ICE. It summarizes information on illegal alien drunk drivers arrested or incarcerated in these jurisdictions, or the number of drunk driving charges levied on illegal aliens. Most of the numbers were extracted from databases used to track aliens arrested under the auspices of 287(g) and/or Secure Communities (except for the Virginia Dept. of Corrections numbers, which are from a study done for the Virginia State Crime Commission). Some of the 287(g) agencies have made the removal of illegal alien drunk drivers an explicit priority, often because of public outcry after an illegal alien drunk driving fatality in their jurisdiction. In all jurisdictions for which data were obtained, the number of arrests of illegal alien drunk drivers was significant, representing at least 7 percent of all illegal alien arrests. In some areas, drunk drivers represent one-fifth to one-third of the criminal illegal alien caseload — far more than the corresponding share of ICE's caseload. In one county examined, Rockingham County, N.C., more than half of all the illegal aliens in jail had been arrested for drunk driving. Clearly, in these communities, immigration law enforcement is contributing to public safety, as it results in the removal of individuals whose behavior is dangerous to others. While I recognize that these figures are by no means exhaustive or necessarily representative of the country as a whole, they are a mix of large urban, suburban, and small rural communities, and I find it interesting that some of the local agencies with immigration enforcement authority have a much higher share of their criminal alien cases that are drunk drivers than ICE does. There surely are many possible explanations for this, including the fact that different communities have different crime problems. However, it caused me to wonder if ICE is removing only a portion of all of the illegal alien drunk drivers that the local agencies refer to their agents in the field offices, and how large a portion. Detention Is Key to Ensure Removal and Protect the Public. By focusing on the identification and detention of illegal alien drunk drivers, this bill will make sure that ICE and local law enforcement agencies can fulfill their responsibility to remove them from our communities. In my view, the most important provision is the amendment to the Immigration and Nationality Act to require the detention of illegal aliens who are apprehended for drunk driving. Detention has been proven to be the most effective way to ensure that aliens who are here unlawfully and who are a priority for deportation are actually removed. Experience and studies have shown that illegal aliens who are not detained, especially those who are facing criminal charges, often will flee from proceedings in order to avoid prosecution and removal. One recent study published by my organization found that nearly 60 percent of aliens who are not detained while in proceedings will fail to appear for their hearings or will ignore orders to depart.2 Some of these individuals, such as Saul Chavez, who killed Dennis McCann in Chicago last year,3 also flee from local criminal proceedings. Absconders are a huge problem in our immigration system. In 2010, there were 715,000 aliens present here who had failed to appear in immigration court or who had disobeyed orders to depart. This is a 28 percent increase over 2008. Today there are more than one million unexecuted orders of removal, and the number has increased more than 84 percent since 2002.4 Given the unique risk that illegal alien drunk drivers in particular pose to society, it makes sense that these individuals should be detained pending their removal, to dramatically increase the chances that ICE will be able to carry out the order of removal if it should be issued. Current ICE Policies Inadequate. Of course, ICE already has the authority to detain illegal alien drunk drivers; the problem is that current policies constrict officers in the field from doing so in many cases. Even as ICE has ramped up programs to identify removable aliens who are arrested, the amount of funded detention space has remained flat. Meanwhile, ICE officers currently are discouraged from using some of the more efficient methods of removal, such as stipulated removal and expedited removal. Most problematic, as this committee is aware, within the last year, the White House has directed ICE to implement policies that exclude all but the most egregious offenders from immigration law enforcement, under a scheme it euphemistically describes as "prosecutorial discretion", but in practice is more like an amnesty, even for some illegal aliens charged with crimes. ICE agents in the field are instructed to refrain from arresting, charging, and detaining illegal aliens who have not yet been convicted of a crime as well as those aliens who have U.S. citizen relatives, are students, or meet other broadly drawn criteria that the administration apparently believes should be grounds for immunity from immigration law enforcement. As a result, from what I hear from local law enforcement officers in different parts of the country who are familiar with these cases, a significant number of removable aliens who have been charged with crimes who formerly would have been detained while in proceedings are now being released. It is certain that some unknowable number of illegal alien drunk driving offenders are benefiting from these lax policies. Typically, drunk driving is not a felony charge unless the offender has prior offenses, sometimes multiple prior offenses. Often there is no trial and no conviction per se; most first-time offenders are fined or receive a continuance. It is entirely possible that many immigration agents in the field believe they are to refrain from charging and detaining illegal alien drunk drivers unless they have felony convictions. In his recent appearance before this subcommittee, ICE's director of Enforcement and Removal Operations acknowledged that some drunk driving offenders have been released by ICE, including the President's uncle, Onyango Obama, an immigration fugitive ordered deported in 1992, who was arrested in Framingham, Mass., last August, and is accused of nearly ramming a police car while driving drunk. In addition to putting the public at risk, these policies and practices have the cumulative effect of eroding the relationships between state and local law enforcement agencies and ICE, which had slowly improved since the agency's creation, and had started to overcome the reputation for unresponsiveness that was one unfortunate legacy of the INS. Now, when ICE fails to follow through on referrals from local agencies and is overly selective about which criminal aliens it will accept for processing, this breeds frustration among local partners, reduces their willingness to work with ICE, and damages the reputation of the agency and its personnel. Local Sanctuary Policies Shield Criminal Aliens from ICE. But ICE policies are not the only obstacle to removing illegal alien drunk drivers. A number of state and local governments have adopted policies designed to thwart immigration law enforcement and shield many illegal aliens, even those charged with local crimes, from coming to the attention of ICE. The most egregious of these policies is in Cook County, Ill. There, local officials have long barred ICE agents from screening aliens in the county jails, and recently enacted an ordinance to forbid the county sheriff from honoring ICE detainers. Other jurisdictions with similar criminal alien sanctuary policies are New York City, San Francisco, Santa Clara County, and New Haven, Conn. In addition, several states and localities, including Massachusetts, New York, and Illinois, have asked to be kept out of the Secure Communities program. We all expect that some states and localities will adopt eccentric policies, and their leaders are presumably accountable to the voters who put them in office. But some of these policies may be in violation of federal laws that were enacted to prevent states and localities from going too far and actually obstructing the ability of federal agencies to enforce immigration laws. Yet the Obama administration has chosen to allow the interference to continue, even as it has filed lawsuits and initiated other hostile actions against states and localities that choose to assist in immigration law enforcement. Further, the administration has taken no action against those jurisdictions, such as San Francisco and the state of Connecticut, that have established policies directing law enforcement agencies to ignore ICE detainers. While the executive branch cannot prevent state and local governments from enacting laws or policies that interfere with immigration authorities, it does have a number of tools at its disposal to dissuade them. The Department of Justice could file a lawsuit and seek an injunction in federal court against the sanctuary jurisdictions, as it has done against Arizona, Alabama, and Utah, that do the opposite and have passed legislation seeking to assist in enforcement of immigration laws. It could allow the FBI and DHS to exercise their authority to implement the Secure Communities program in those places that restrict ICE access to jails, so that ICE agents would have information on aliens who get arrested, and could try to take action. In addition, the Department of Justice and DHS could work together to deny federal law enforcement and homeland security funding to any agency or jurisdiction that refuses to participate in Secure Communities, bars ICE agents from jails, or fails to honor detainers. None of this requires action by Congress. Rather than use its authority and leverage to discourage sanctuary policies, the Obama administration has adopted a strategy of appeasement. It has held off implementing Secure Communities in New York, Illinois, and Massachusetts in deference to the governors who object, even though many law enforcement agencies in those states have begged to be activated. In the most surprising move, just a few weeks ago, ICE Director John Morton offered to pay Cook County an additional sum of money tied to the average cost of incarceration if the county would agree to permit ICE to have access to removable alien inmates. This offer is an unprecedented concession that verges on allowing the agency to be extorted in exchange for the ability to enforce federal immigration laws. If this arrangement is implemented, it is virtually certain that other counties will attempt to follow suit. Provisions for Local Officers to Issue Detainers and Transport Aliens to ICE. This bill will authorize local officers to issue federal detainers to keep suspected illegal alien drunk drivers in local custody and to transport them to federal custody, after they have verified the offender's status with appropriate federal agencies. This especially will assist those local agencies in areas that are distant from ICE field offices and in populated areas where ICE enforcement officers are overwhelmed with criminal alien caseloads. Transporting illegal aliens to federal custody for removal processing has always been a logistical sticking point in the system, and authorizing payment to local agencies for this expense will enable many more agencies to assist ICE. In addition, local agencies should be encouraged or incentivized to devise low-cost solutions to this problem. For example, several years ago, the sheriff's office in Allen County, Ohio, set up a system that relied on specially trained auxiliary peace officers to pick up and transport aliens to ICE in a coordinated fashion along organized circuits that covered all parts of the county and eventually 17 other counties in northwest Ohio. This system, which also included training dispatchers and jail booking officers to perform the Law Enforcement Support Center (LESC) checks, was a highly efficient and cost-effective solution in a region that lacked adequate ICE coverage.8 ICE's Office of State, Local, and Tribal Coordination should be directed to conduct pilot programs based on this model and other promising ideas that may be devised by local agencies. Lawmakers should be aware that, unfortunately, surprisingly few local law enforcement officers are aware of and making use of the LESC to verify the status of aliens they encounter. For example, only about 10-20 percent of the officers taking the training programs I teach through Northwestern University's Center for Public Safety have even heard of the LESC, much less use it as a resource. In some states, the police training programs include no mention of the LESC or how to perform IAQ queries through the NLETS system, so officers have no idea how to verify the status of an alien. The lack of such basic immigration training programs for local officers is a glaring deficiency at ICE that needs to be corrected in order for the agency to succeed in its key mission to identify and remove criminal aliens. ICE should be directed to increase outreach and training programs on alien status verification as part of this legislation. Some of ICE's local partners report concerns that the LESC is unable to keep up with the current volume of queries. In addition, they report that an increasing number of aliens they arrest and identify as removable and transfer to federal custody, who in years past would have been removed, are being released back into their communities, due to increasing selectivity on ICE's part. They report that this is a result of instructions from ICE headquarters, not a result of local ICE decision-making. Cost and Effect on ICE Priorities. Critics may try to suggest that this bill is too costly to be practical, or that the mandatory detention provisions will bog down the system and prevent ICE from dealing with "more serious" offenders. This is not necessarily the case. Contrary to statements made by administration officials, ICE is not limited to a certain number of removals each year, even with finite funding for detention and removal operations. Although I would argue that ICE certainly could use additional funding; still, there are numerous ways in which ICE can do more with the same level of resources. Our research shows that in recent years ICE has made less use of the most efficient methods of removal, which are those that do not require the alien to appear before an immigration judge. These include expedited removal, stipulated orders of removal, administrative removals, and even reinstatements of prior removal orders. The result has been a significant increase in the number of cases before the immigration courts and a significant increase in the length of time it takes to resolve cases and remove illegal aliens. This situation is unfair to the aliens, costly to taxpayers, and decreases the functionality of the immigration courts. If ICE were to make more use of these options, it could increase the number of removals without compromising due process or skewing its priorities. In addition, ICE should increase the number of agencies participating in the 287(g) program. This is a highly cost-effective force multiplier for ICE, since the local agencies provide the personnel to screen aliens and issue detainers. It is especially helpful in addressing the illegal alien drunk driving problem, as it is the local agencies who encounter these offenders and, in my experience, most are more than willing to assist ICE in processing them for removal. Victims Advocacy Unit Needed. Congress should direct ICE to establish a Victim's Advocacy Unit to address the concerns of those who are victims of crimes and other damaging actions committed by removable aliens. Unlike illegal aliens, who have a newly designated advocate,9 currently these victims and their families have no voice within the DHS bureaucracy, no avenue to get their questions answered, and no way to help ensure that immigration law enforcement failures that have tragic consequences are not repeated. The Victims Advocacy Unit would provide a point of contact for those directly affected by alien crime and be empowered to investigate incidents and trends with the goal of identifying system breakdowns and correcting policy or procedural gaps. In addition, the unit staff would work with established local and national victims organizations, such as Mothers Against Drunk Driving, on issues of common concern. 1 Mothers Against Drunk Driving, Fact Sheet on Drunk Driving in America, www.madd.org. 2 Mark H. Metcalf, Built to Fail: Deception and Disorder in America's Immigration Courts, Center for Immigration Studies, May 2011, http://www.cis.org/Immigration-Courts. 3 Jessica Vaughan, "Cook County Pressured to Reverse Sanctuary Policy", Center for Immigration Studies Blog, January 6, 2012, http://cis.org/vaughan/cook-county-pressured-to-reverse-sanctuary-policy; and "The Alternative to Immigration Detention: Fugitives", October 18, 2011, http://cis.org/vaughan/alternative-to-detention-fugitives. 5 Maureen Maloney, "Immigration 'magnet' claims a young life," Milford Daily News, March 4, 2012, http://www.milforddailynews.com/opinion/x1014037076/Lazcana-Life-death-…. 6 See W.D. Reasoner, "Which Way, New York? Will Feds Tolerate Local Interference or Assert Their Authority?" Center for Immigration Studies Memorandum, October, 2011, http://cis.org/nyc-local-interference; and Vaughan, "Cook County" Blog, January 12, 2012, cited above. 7 Michael Volpe, "63 Illegals Arrested After County Sets Them Free", World Net Daily, February 25, 2012, http://www.wnd.com/2012/02/63-illegals-arrested-after-county-sets-them-…. 8 For more information, see "Immigration Law Enforcement: Beyond 287(g) and Secure Communities", training webinar produced by Jessica Vaughan and presented at the June 2011 National Sheriffs' Association annual conference, and available through the Law Enforcement And Public Safety Network, http://leaps.tv/pgm.php?program_code=201106190900. 9 Andrew Lorenzen-Strait, "ICE Announces First Ever Public Advocate", http://blog.dhs.gov/2012/02/ice-announces-first-ever-public.html.